When I read 'Little Fires Everywhere' I had no doubt in mind why it was chosen as the best fiction book for the year 2017, by Goodreads. Celeste Ng's writing was beautiful and uncomplicated. The story had a human touch and nothing like that to enhance stories. 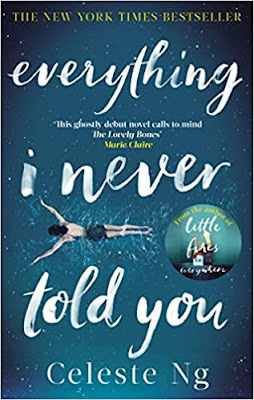 Everything I Never Told You was her debut novel and was applauded by many. That was reason enough for me to pick it up. James and Marilyn Lee are a mixed race couple living in America with their three children. James is the academically gifted child of Chinese immigrants, yearning to belong and be accepted by the Americans. Marilyn is an American ambitious woman brought up by a single homemaker who believes that her daughter should focus on being a good wife and mother. When Marilyn discovers that she's pregnant with her first child, she gives up her dream of being a doctor and she and James have a quick wedding must to the chagrin of her mother for marrying someone of Asian descent. Marilyn intended to resume her studies to become a doctor after her son, Nathan, was born, but after a second pregnancy, with Lydia, she remains a homemaker for eight years. A life she has always hated thanks to her mother. Due to this, one fine day, Marilyn abandons the family in order to pursue her academic studies. James believes that she's left because their children are of mixed race and she cannot handle the societal pressure of being outsiders. When Marilyn is away, she discovers that she's pregnant with a third child and after nine weeks, comes back to the family. Not wanting to leave her children again, she decides to stay home and be just a mother instead. Not wanting to give up on her ambitions, Marilyn forces it on Lydia and begins to encourage her to become a doctor. Even when Hannah is born, Marilyn's focus continues to remain on Lydia, aggressively training her in maths and science. Both James and Marilyn begin to look at Lydia as their saving grace hence pushing the other two children to self-doubt. Nathan is constantly being bullied or avoided by his father as James believes that his son is as friendless as he was during his childhood. Hannah on the other hand is happy being the silent observer and craves for the love from her siblings. Nath and Hannah try to make the best of what they have, knowing very well that Lydia is and will always remain their parents' favorite child. So what happens when Lydia goes missing one day and a few days later her body is dredged out of the town lake. How will the family cope with this loss? Who killed Lydia? Celeste Ng is the master of family drama and she builds the characters of the Lees perfectly. The story revolves only around the family with an occasional outsider in Jack, the next door neighbor. This book brilliantly shows what happens to children when they are burdened by the expectations of their parents. The parent-child relationship is fragile, no doubt and needs to be handled delicately. But, the burden of expectations is known to take anyone down, let alone young growing children. The author handles the story very well, intricately looping in the point of views of the three children and their parents. Even if you keep the parenting aside, it also raises another pertinent question. Is love enough to survive all odds? It is pretty much predictable half-way through the book about what could have happened to Lydia, but that doesn't take away the essence of the book. The title of the book could be justified for every character. Although the family of five lives together and seem happy, there is so much unsaid between them. Each character is battling demons of their own amidst the face of tragedy. While Marilyn is trying very hard to not end up like her mother, James doesn't want his children to go trough the same thing he did as an outsider. Nath is jealous of Lydia for being the favorite child and cannot get himself or his parents to trust his own successes. Hannah on the other end is clearly aware of being the unwanted child and yet tries her best to co-exist with her siblings. Each character is etched beautifully and brings so much to the story. That's the beauty of this author's writing. Now, coming to the question of if love is enough? I did not understand why James did what he did, but if he loved Marilyn enough and understood her predicament, would he have still done it? Being a mixed race couple and raising children of mixed descent is never easy, but when you know what you are getting into and are doing this for love, shouldn't that be enough? This question remains highly debatable. Verdict: An excellent take on love and relationships in the wake of tragedy. Definitely worth a read. It's hard to grow up as mixed race kids, specially without the support of parents. I could feel for the other siblings. This feels like an intense read. Loved your review and it has made me curious about the ending. If complex family drama is your thing, this one is right up your ally. This is one of my favourite books - it is in my top 5 books that I recommend to people. Absolutely loved it when I read it a couple of years ago. Ditto! It teaches one a lot about the human psychology and the pressures and repercussions of wrong parenting. Must be made a must read for all parents. OMG I want to read this one. I have come to realise that books that explore complicated relationships are my absolute favourites. This one seems to fit the bill. Same here, Tulika. Thrillers and mysteries are always good, but nothing like a book on complex twisted relationships. They teach us so much about the human mind. Do read this one, I'm sure you'll love it. I love complex family dramas and this one seems perfect for that. Thanks for the review, Soumya! Adding it to my TBR right away. Do read it, Rachna. It is really good. I have heard so many great things about both her books. Which one do you recommend to pick first? Or does it not matter? Either one you can pick up, they are both equally brilliant! What an intriguing plot! I loved your review, Soumya, as always! I am going to add it on my TBR for sure. I am currently reading Little Fires Everywhere and is quite impressed with her writing style already. Do read this out, it is equally good! I have heard of the writer though I don't remember in what context, I must have heard about this book then. Sounds like a beautiful book and something all parents should read. Your kids are not supposed to be the bearers of your dreams, that's what I learnt and repeat to myself every single day since I have become a parent. Loved your review Saumya! Thank you, Anshu. Do check this one out. Wow! This sounds like a book I should read and soon. Your review of it is very compelling and I am hooked Soumz! Parents harbouring their own demons and then foisting them on their children is the saddest way to bring up kids - its a torture street and there is just no getting out of it! Tell me about it! I'm one such survivor too so I know! Do read this one, you will love it!